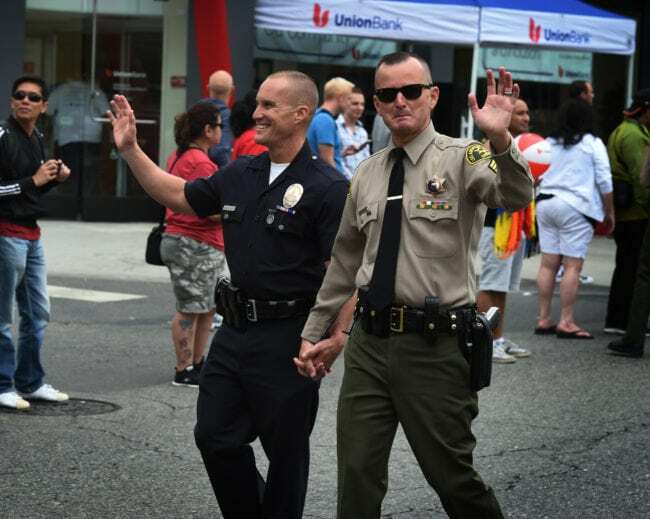 Holding hands in public is something that two thirds of LGBT+ people avoids doing for fear of negative reactions. The shocking statistic concerning this simple act of affection was published on Tuesday as part of the largest-ever survey of LGBT people undertaken by the UK government. The data resonated across the LGBT community, sadly too aware of the problem. PinkNews asked its readers to share their experiences of holding hands in public and immediately received several responses, while other social media users felt compelled to share their stories of discrimination in response to the survey. Both people casually dating and couples who have been married for years have been confronted with homophobic acts when showing affection to their partner in public spaces. Issy was one of the people who shared her experience on Twitter: “I went on a date and she got roses and gave them to me in the restaurant, but I couldn’t take the amount of looks. Some smiled, others stared & whispered about it. I was so uncomfortable,” she wrote, adding that the survey result did not surprise her. These experiences are sadly not unique. “[We] have had homophobic abuse shouted across the street. Felt threatened by a group of lads, staring at us and joking with their mates about ‘those queers’,” Nick–who asked to be identified only with his first name for the purposes of this article–told PinkNews, describing two separate incidents that took place in London and Oxford respectively, while he was out with his husband. The two live in Oxford, but have to think carefully about where they go, choosing their travel destinations on the basis of their perceived gay-friendliness. Currently on holiday in Brighton, Nick said he and his husband were able to enjoy an evening walk down the seafront, holding hands, without experiencing any anxiety. “We have to think about where we are and people’s reactions,” he said, adding that this constant sense of watchfulness is unnerving and can have an impact on the relationship. “I’m always keener to hold hands and hubby is more cautious. I used to be married to a woman and never had to give holding hands a second thought anywhere,” he added. Tara MacLachlan has also felt the difference about being out in public with her wife of 30 years after her transition. “Since my Transition in 2016 we no longer hold hands in public. Not because we don’t want to, but because of possible negative reactions,” she wrote in a tweet. 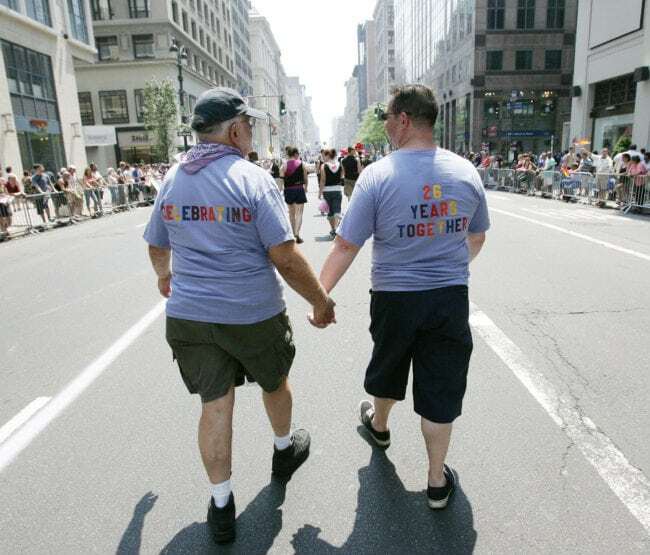 There is one place where they feel comfortable: “We do hold hands at Pride Events,” she added, highlighting one of the reasons why Pride marches still hold a huge importance to the community. “As I’ve grown older I’ve come to realise that the reason is more to do with the fact that I’m just not comfortable with the reaction of people around us.” Taylor said. “Manchester is an incredible city, and one of great tolerance and acceptance, and yet, every so often there’ll be somebody that says something, even when we’re not holding hands that makes me realise we aren’t quite where we need to be,” he added. The situation does not improve with going abroad. Taylor, who got in touch with PinkNews from Croatia where he was on holiday with his husband, said he thinks about his public behaviour even more carefully when traveling to foreign countries. “I say to myself that to hold hands would be to break their custom, to go against their accepted norms. In reality, it’s simply me denying myself, because of the opinions of others, and constantly having to live your life by the attitudes and beliefs of others is wearing and draining if you think on it for too long,” he said. Matthew Cooper told PinkNews that him and his boyfriend have luckily not experienced abuse in the UK, but they conduct thorough research about LGBT+ rights in foreign countries they wish to visit. “Major cities in Poland, Latvia and Hungary are some of the locations we have researched before arriving to ensure what what we do so freely in the UK is ‘acceptable’,” he said. He particularly recalled a visit to the Nazi concentration camp of Auschwitz, in Poland, where he felt like he and his partner had to refrain themselves from comforting each other with hugs or holding hands. Cooper hoped that more awareness of the issues faced by LGBT+ people in their everyday life could contribute to fighting this kind of discrimination. “Education of what members of the LGBT experience could be one step to show how much more is needed,” he said.